Watching Olympian Kerri Walsh compete in beach volleyball last week, many viewers were wondering the same thing: what is that black thing on her shoulder? A tattoo? A bizarre fashion statement? No. Ms. Walsh was sporting a new type of athletic tape called Kinesio, touted by physical therapists as a better way to relieve pain and promote healing of injured muscles. The appearance of Kinesio on the well-toned Ms. Walsh — she even wore it while meeting President Bush — has spurred international interest in the little-known brand. In black, pink, blue and beige, the tape has been spotted on a number of other Olympians, including the shoulder of U.S. water polo player Lauren Wenger and the elbows of Canadian Greco Roman wrestler Ari Taub. Members of Spain’s basketball team and Jamaica’s track team are wearing it. Ms. Walsh and the other athletes don’t have endorsement deals with Kinesio USA; the company simply donated 50,000 rolls of the tape to 58 countries for use at the Olympic Games. But whether its appearance on the international athletic scene is a sign of its therapeutic benefit or just smart marketing remains to be seen. Traditionally, white athletic tapes are wrapped around gauze to form a stiff bandage that immobilizes a joint or muscle. By comparison, the 100-percent cotton Kinesio tape is said to be modeled on the thickness and elasticity of real skin. The flexible tape is applied to the skin in specific patterns, depending on the injury, a technique designed to create support and guide injured muscles and joints without limiting the athlete’s range of motion. “This tape moves with the body, so the biomechanics are still there,'’ said John Jarvis, director of Kinesio USA. Both the tape and the new wrapping technique have spread mostly by word-of-mouth among athletes and trainers who swear by it. Cycling great Lance Armstrong reportedly dedicates a page to the tape in his latest book. Recently soccer superstar David Beckham traded jerseys after a game and was spotted with pink Kinesio tape on his back. 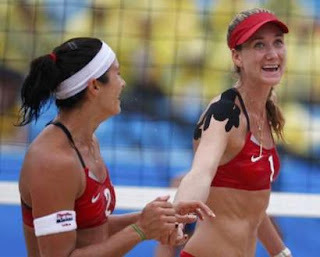 Given Kinesio’s high profile at the Olympics, it seems likely that we will be seeing more and more of it. Mr. Jarvis said the tape already is used by many professional basketball, baseball and football teams. Before the Olympics, the company Web site received about 600 views a day. Since Ms. Walsh appeared with the spider-like Kinesio pattern on her shoulder, Web traffic has jumped to 345,000 views daily.